Chanel has launched Coco Mademoiselle Eau de Parfum Intense. 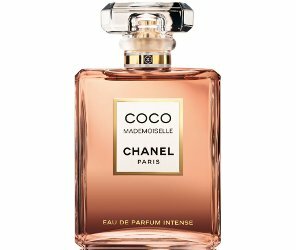 Coco Mademoiselle Intense is a flanker to 2001's Coco Mademoiselle, which was a flanker to 1984's Coco; it will be fronted by Keira Knightley. Coco Mademoiselle Intense was developed by Chanel house perfumer Olivier Polge, and reportedly intensifies the patchouli fraction. Additional notes for the woody amber oriental include bergamot, orange, rose, jasmine, tonka bean and vanilla. Chanel Coco Mademoiselle Eau de Parfum Intense is available in 50 and 100 ml. It is currently available on "preview" in select countries and will go into wider distribution at the end of the month. Update ~ the description from Chanel: "An intense new facet of the COCO MADEMOISELLE personality emerges to forge a powerful, deep, addictive fragrance that is irresistible in every way. An extreme, luminous and deep concentration of Patchouli infuses COCO MADEMOISELLE EAU DE PARFUM INTENSE with a voluptuous dimension. The warm, soft and feminine Amber accord — an intoxicating blend of Tonka Bean and Vanilla from Madagascar — wraps the scent in sensuality." Does the world need an intense version leashed upon it? I don’t even need the original. Amen, I feel like original one affects me pointedly, painfully and from across rooms. Ah, I heard about an “intense” Coco Mad on a YouTube channel. I would like to give it a sniff. Will be interesting to see what he does with it! I think the original is pretty intense as is, not sure this will be a ‘go’ for me. I have the original Coco and Mlle, I’m set for life! Ditto that…. I have come to terms with patchouli, but but but…. At least it’s not another bland flanker for Chance. Give me the original Coco forever and ever and that is all I need. I feel exactly the same. Vintage Coco is just perfect. Hey, wait, Coco Forever is a great name for (another) flanker…. Coco Mademoiselle Intense…so, Coco then? Rather try this than the intense Flowerbomb, though. Ha! A perfume I blind bought was delivered today, and had to cover it with Angel! (But I like Angel). I would at least be willing to give it a sniff. Can’t hurt, right? I love Coco and was never a fan of Mademoiselle. It is already too strong, so I do not understand how more intense it needs to be. Money saved for me. I think an stunning new release from Chanel must be forgotten! I have not tried any recent formulation of Mademoiselle, even though I have a sample that my sister passed to me in December when she made a Chanel purchase. I will have to try it and see how much it has changed, but I still think it is not for me. I’m a patchouli fiend (and actually like Coco Mad although I don’t wear it because it seems as though practically everyone else around here already does) but that might be a step too far even for me. But hey, to each his own, right? I wore mademoiselle when it first came out. But tired of it fast. This has my attention because of the bottle. I’m actually hoping i like it. I have to think this is actually going to be a de-amped version of Coco Mad, just as Coco Noir was far from noir. My bff gave me some vintage Coco. Now that was a beauty. I wore it to my sister’s wedding. Wasn’t this basically what Coco Noir was? I will give it a cautious sniff, but my expectations are very low, as I don’t like Coco Mad. I, for one, am eagerly awaiting Lidl’s Suddenly Madame Glamour Intense. (And that probably went over peoples head. Even though I aimed below the belt).